There you are, naked and alone, just struggling to survive in a frozen wasteland, when a dire wolf sneaks up on you and eats your face. 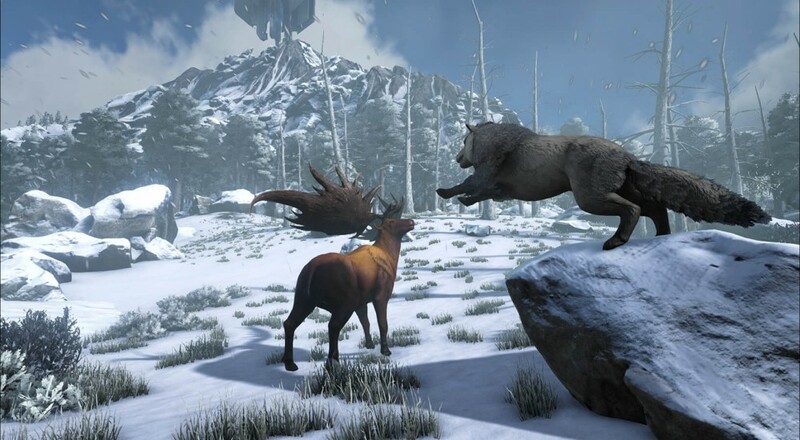 It is the height of annoyance and you can now experience it thanks to a recent update to ARK: Survival Evolved. The most recent update to the massive survival/action title included two new environments for players to explore (and die in): the snow and swamp regions. As one might expect, each of these areas includes appropriately themed hazards, such as snakes, alligators, and piranhas for the swamp, and dire wolves and "Megaloceros" (Megaloceri?) for the snowy area. I'm just curious if players will need to develop bug repellant to ward off mosquitos in the swamp. ARK: Survival Evolved is still in Early Access with a rough release date of some time 2016. Page created in 0.2700 seconds.